For nearly four months now We’ve been tasting the states, making friends along the way. 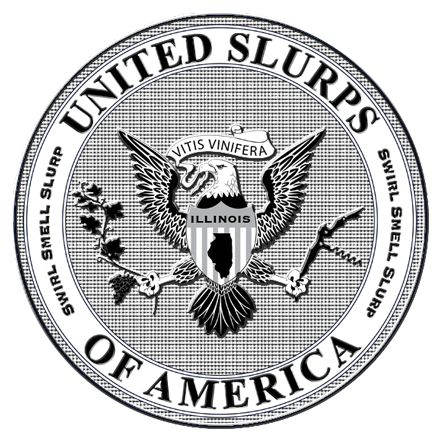 A true delight of our Slurpin’ America project has been our collaboration with regional wineries and wine-lovers. For each state We’ve tasted (twelve so far, whew) We’ve teamed up with local bloggers to get their take on their state’s wine. It’s been refreshing (and insightful) for Us to add new voices to our He said/She said blog. While the collaboration has been a delight, the logistics for coordinating USA has taken a lot more work and time than We initially anticipated. We naively thought We would taste a different state each week. Hmm…No. Just when We were in a panic about which state would be next, We were contacted by Mike and Evelyn of He Sipped/She Sipped, a blog hosted by ChicagoNow, a division of the Chicago Tribune. Their blog is just a few weeks old, but already they’ve posted dozens of reviews of local shops and restaurants, wines from all over the world, books, and more. As they say “anything wine-related from the Loire to the Loop.” So We had our co-bloggers, We just needed a winery. Lynfred was an easy candidate, being the state’s oldest, having produced wines since the 1970′s. We contacted the winery and they graciously offered to send samples across the nation to Us in California and to their neighbors Mike and Evelyn, 30 miles away. She said: Clear, light yellow. Aromatic and perfumey nose with aromas of tropical fruit and ripe apples. On the palate the wine is floral but with an underlying acidity. Minerals, aromatic herbs, and limes in the finish, reminding me of a limey gin and tonic. I enjoy the arc of richness in the nose to the austerity of the finish. Zingy, refreshing–a nice summertime sipping wine. If it was half the price I’d stock up (and give it a higher rating). Sipped: I don’t think I’ve ever had a French-American hybrid before, so I really didn’t know what to think going into this. This wine definitely exceeded my expectations – even if those expectations were pretty low. 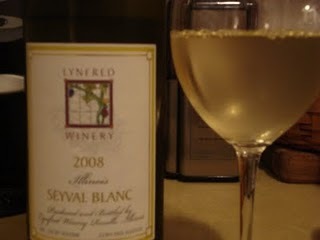 The Seyval Blanc ia a light to medium yellow color in the glass. The nose is pretty light and perfumy with a hint of apple and banana in the background. On the palate, this wine is smooth and enjoyable. It has flavors of sweet ripe fruit, but the wine was actually pretty dry. Lynfred lists it as a semi-dry wine, but at only 0.7% residual sugar; it’s not very sweet – and that’s a good thing. Sipped: On the nose I get fruit, mostly bananas. In my mouth, it’s light and smooth but subtle. This wine is easy to drink; I’d call it a picnic white. I can imagine it with cheese and bread and a warm day. It’s good but not great, and I’m not sure I’d pay $25 for it. Sipped: As Chicago bloggers, Lynfred winery and its wines took us by surprise. We have to admit we didn’t have high expectations. Most wine in the area is fruit wine and over-the-top sweet, which is not our thing; however, these wines were drinkable and then some. We’ve never been to Lynfred, but we’re making a phone call this week—and we’ll be there soon. The samples proved that it’s worth a trip out there—to Roselle, IL, which is 30 miles outside of our home in Chicago. Chicagoans typically think of that area, just south of Schaumburg, as suburban hell, and nothing but a needed-trip-to-IEKA can get us city folk out there. (Kind of like Burbank, for you LA folk; She Sips used to live in Sherman Oaks.) But we’re going to check out Lynfred, because we deem the wine surprisingly worth it. She said: A big “cheers” to Lynfred Winery and their Marketing Director, Christina Anderson-Heller. These are good, generous people. And they like to interact with fellow wine-lovers: friend them on Facebook and follow them on Twitter, you’ll enjoy it. Although Lynfred sent both Us and He Sipped/She Sipped several bottles of wine, just one was made from grapes grown in Illinois. We wanted to stay to true to the “tasting local” concept of the project, so We are going to reserve the other bottles for a future post. And finally, a clink of our glasses to Evelyn and Mike. It’s been great to virtually “meet” another wine blogging couple. We love Chicago and know We’ll be visiting. We look forward to tasting the town with you. In the meantime, We’ll be following your adventures on the blog.